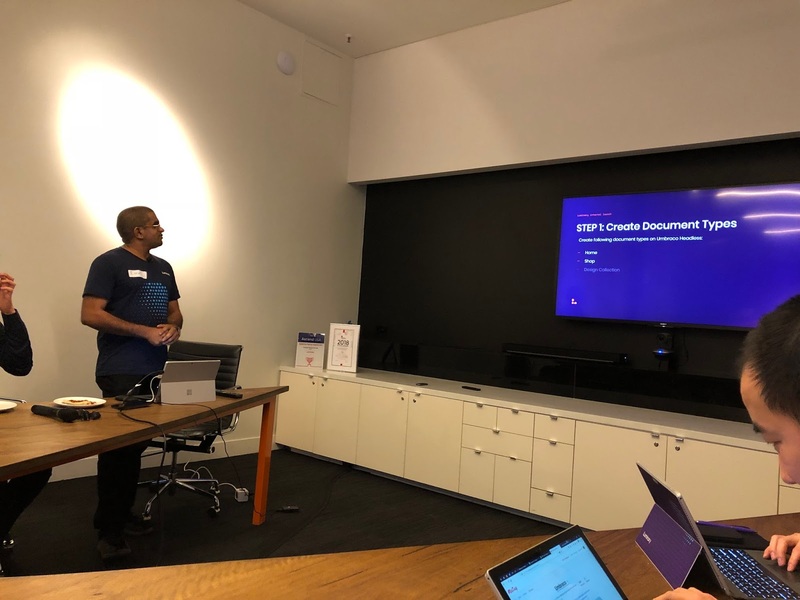 Two weeks back, I had the privilege of presenting something special at the Melbourne Umbraco Meetup. 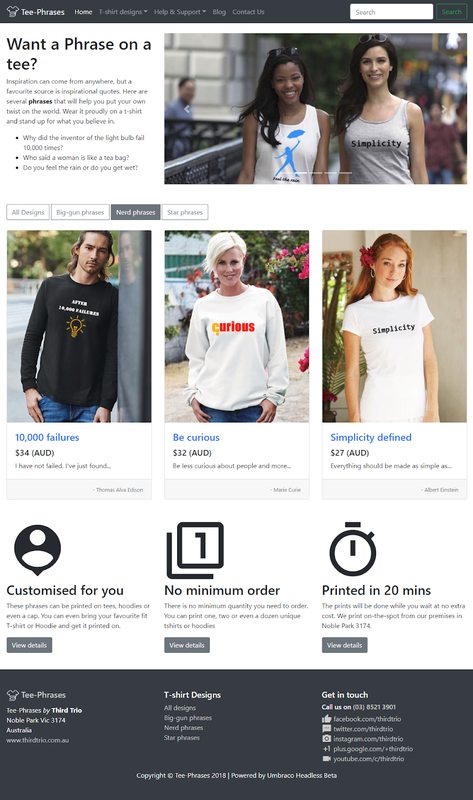 We built a .NET Core MVC website using Umbraco Headless. Yes, we know it's BETA and still in preview. But who could resist? I've been working with production builds of Headless CMS driven websites for some time now and thought it's time I gave Umbraco Headless a go. Want to try it out on your own too? We've got the slide deck and the live video as it happened for you to follow along. We had 10 participants for this meetup and we built https://tee-phrases.thirdtrio.com.au from the ground up following the tutorial below. Oh! Most of the participants did turn up with the prerequisites mentioned here in place. So with bellies filled with pizza, carrot sticks and beer/coke, these Umbracians enjoyed coding away for 2.5+ hours. The tutorial slides for building the Umbraco Headless website is given below. You can download the slides here. The live recording from the Umbraco Meetup on the 7th of August is given below. It has not been edited and is the raw version. You might need to skip through some of the video feed as we make sure everyone keeps up. Note that the version of the Umbraco Headless Library (0.9.4-ci-20180726-02) I used was out of date pretty soon. So I had to include that as a local package on this repository for it to work. I will be working on incorporating the version using Refit as soon as I get some time. Pull requests are welcome if you get to that before me. The completed version of the source can be found on this branch. This implementation is not production ready and we need a few more tweaks before we could go to our clients with Umbraco Headless. So my idea is to speak to the Gurus at Umbraco HQ and maybe submit some issues to the issue tracker to get the ball rolling. We meet once in every two months and our next Melbourne Umbraco Meetup will be on Tuesday, 2nd of October 2018 at Luminary. You can sign up for the meetup here. Want to build a .NET Core website with Umbraco Headless? Do you want to learn how to build https://tee-phrases.thirdtrio.com.au/ using .NET Core MVC with Umbraco Headless? On the 7th of August 2018 (Tuesday) at 6 PM, I will be presenting (tutorial style) at the Melbourne Umbracian Meetup on how to do that. Please confirm your attendance at https://www.meetup.com/Australian-Umbraco-Meetups/events/249881087/ (even if you are joining in remotely). Make sure you have the following prerequisites if you intend on joining us and making the best use of everyone's time. You can find instructions at umbraco.com/headless. Keep your CMS empty. We will populate content as we do our Tutorial. Still not sure? You can check it using the instructions here. Have you installed the latest version of Visual Studio 2017 or Visual Studio Code? I've got VS2017 (v15.7.5) and VS Code (v1.25.1) running on my machine. I will be mainly using VS2017 for this tutorial though. Have you installed a Git Client you are comfortable with? You will need to pull changes and switch branches. I will be using Git bash, but you are free to use whatever Git client you favour. You need to complete the following task before 6 PM on the 7th of August 2018. That's it! You are ready! Sign up for the meetup and I will see you there. Ever printed an UCommerce Invoice off the Umbraco (v 7.5.10) back-office?